Dr. Sabourin has been practicing dentistry in the La Jolla area for over 30 years. After earning his degree in dentistry, he completed a general practice residency program, where he worked one-on-one with specialists in many areas of dentistry. Dr. Sabourin has won Top San Diego Dentist for the last six years. He has also received several other honors and awards of excellence. Dr. Sabourin keeps himself up-to-date on the latest techniques in dentistry by doing far more than the required amount of continuing education. Missing, Decayed or Broken-Down Teeth? Your first step in better oral health, a more attractive smile or teeth that function properly, is to come in for an exam and consultation, so Dr. Sabourin can evaluate the condition of your teeth and gums. He will sit down with you to discuss your smile goals and create the correct treatment plan for you. Dr. Sabourin’s extensive training and experience make it possible for him to provide comprehensive dental services at a high-level of quality, aesthetics and comfort. His friendly and caring approach creates a comfortable and relaxing environment. He will take the time to find out your needs, what is important to you and answer any questions. He creates a treatment plan that is ideal for your needs and will provide you with the best possible results. Dr. Sabourin can help you with all your general dental needs, including durable, natural-looking crowns, dental bridges and tooth-colored, long-lasting fillings. He can replace your missing or broken-down teeth with dental implants or implant-supported dentures and bridges. If you want to take care of worn, crooked, chipped or stained teeth, Dr. Sabourin can make your teeth look like new: bright, straight and natural-looking, with porcelain veneers, cosmetic bonding, teeth whitening and Invisalign clear teeth straightening. If you teeth need a full-mouth makeover, he provides expert full-mouth rehabilitation to eliminate pain and return your smile to full function and aesthetics. Looking for a Smile Makeover? Click here and learn more about our Cosmetic Dentistry and our Free Cosmetic Consultation. If you need emergency dental care, we will try to get you in the same day. Dr. Sabourin will do an examination to determine the problem. He will get you out of pain and schedule you for further treatment as necessary. Call us at 858-452-2333 to schedule an appointment. Missing, decayed and broken-down teeth can heavily detract from your oral health and smile and cause pain. Dr. Sabourin will always try to save your teeth where possible with gum disease treatment and using durable and natural-looking crowns and fillings. If you do need to extract broken-down teeth, or you have teeth that are already missing, Dr. Sabourin is highly skilled and experienced in replacing teeth. He uses various procedures to help you regain your smile as well as your chewing power. Dr. Sabourin uses a variety of materials to make crowns that are aesthetic and durable. He works personally with top-notch, accredited American Academy of Cosmetic Dentistry labs to ensure high-quality restoration when placing your crown. One of the options for missing teeth is a dental bridge. Dr. Sabourin creates dental bridges that look like real teeth, with similar surface texture and translucency.. However, dental bridges require the teeth adjacent to the missing tooth or teeth to be capped in order to support the bridge. This means healthy teeth will need to be cut down to fit the caps. For patients with healthy adjacent teeth, Dr. Sabourin recommends dental implants to replace teeth as they are healthier and generally longer-lasting. If you need to replace one or more teeth. Dr. Sabourin offers dental implant services, all of which he does in-house. If you need a full arch of teeth or have to replace dentures, Dr. Sabourin offers New Teeth in One Day procedures. Dr. Sabourin takes 3D X-rays using a dental CT scanner to plan the implant placement to ensure that your implants are correctly and comfortably placed. The first step is a Complimentary Consultation with Dr. Sabourin. He will do a visual exam, discuss your treatment options and answer any questions you have. A full-mouth rehabilitation is done when your whole mouth needs repair and rejuvenation. Missing, broken-down and badly aligned teeth can make chewing difficult or even painful and deprive you of eating foods you enjoy or are good for your health. When teeth go out of alignment, you can have problems with your jaw joint, the TMJ, which can lead to jaw pain, headaches and neck pain. Leaving teeth unreplaced can cause misalignment of teeth and also result in jaw bone loss, due to the lack of stimulation from chewing. A full-mouth rehabilitation also returns your teeth to a natural beauty, so you don’t have to be self-conscious any more. Your first step to a rehabilitated smile is an exam, X-rays and consultation with Dr. Sabourin. He’ll give you a treatment plan with options, discuss your alternatives and answer any questions you have. Call us at 858-452-2333 or click here to schedule your appointment..
Dr. Sabourin can gently straighten your teeth with clear Invisalign aligners. 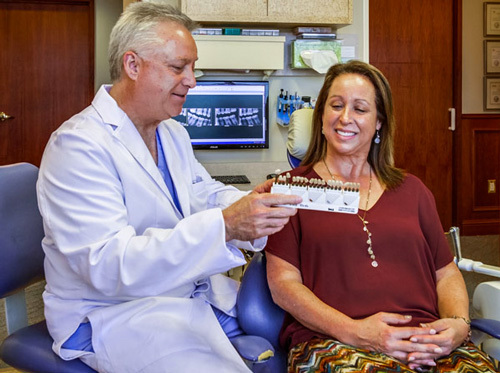 Learn more about our Invisalign treatment.